Property Size 1,784 sq. ft. 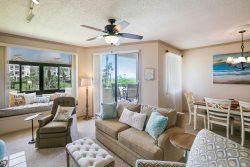 Your beach getaway awaits in Ponte Vedra Beach. Enjoy the magnificent views of the ocean while sitting outside on the patio, new outdoor table and chairs. What better than to walk right down to the beach from your condo or enjoy sitting pool side. The kitchen is fully equipped, dining for 6, open to the living room which has sliding doors to the patio, fireplace (not operable), wet bar and entertainment. The master bedroom has a king sized bed with private bath. The second guest bedroom has two twin beds with private bath and patio. The third bedroom also has twin beds with patio over looking the pool. New carpet installed in May 2018. Washer/ dryer located in hallway.